Gates of Vienna: Whose Law? Most readers are familiar with Elisabeth Sabaditsch-Wolff, the Austrian anti-jihad activist who is facing a “hate speech” charge for one of her recent presentations on Islam. 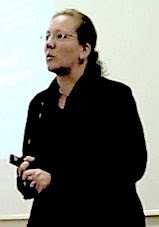 The evening after her “Islamophobic” speech was publicized in the Austrian press — on November 26th, 2009 — Elisabeth gave the third in a series of lectures on Islam. Considering that her previous presentation was the one that brought down the “hate speech” charge on her head, Elisabeth’s lecture that night drew a lot of attention. The video below shows the first part of her lecture about sharia law, which was the final seminar on the topic presented in Vienna. Listen to what she says and see if there’s anything that’s untrue, or inflammatory, or that passes the bounds of reasonable opinion. Like Geert Wilders, she is being targeted for speaking up about matters that the political elite prefer to keep under the rug. Many thanks to Vlad Tepes for the subtitles. The full transcript of this portion of Elisabeth’s lecture is below the jump. Because if we can’t tell the truth any more we can close down everything. Science and schools. I am attracting such things. But somebody has to do this. And it will be me who is doing this. But we didn’t plan that the whole story gets such an explosiveness. They would like to head me off and force me to make statements. Statements which are then misinterpreted. And this is no freedom of opinion any more. And as we said last time that there is no freedom of opinion any more — we have the best example for this now. I just ask for your understanding. If I keep up — okay, if not, please understand it. Some things are wrong, respectively wrongly quoted and misinterpreted but 95% are correct. You know this already. But media don’t and they don’t want to know it. But we will know it. You know this. If you want to hear positive things about Islam, you are wrong here. Then you have to go to the Islamic community, where you will hear the other side. I never said — and I will never say — that the Muslims are evil. I always said, that I feel for the Muslims. And you will agree with that. There were never overall denunciations. We are talking about Islam! Not about Muslims. I want to clarify this. I call upon my right for freedom of opinion with this lecture. This is my right. And I call upon it. And I ask all of you for objective statements. No polemics, no agitation. Just objective statements and questions. But we don’t want to make the Islam-Lobby a case for attacking us. The Islam-Lobby, these are the do-gooders. We are not their idiots. Accused because of agitation. We should think about this. I am a mother and I am a feminist. And I will not let this happen. That women are pilloried again. Think of Oriana Fallaci. Think of Susanne Winter. Think of Brigitte Bardot who was convicted so often. I am just the next in line. Why is it always women. Why is it women who go out and not men. And as a feminist I feel attacked. I fight for women and I fight for my daughter. For that she can grow up in freedom and dignity. This is important for me. I don’t want my words to be perverted. So if we have a discussion, then please in an objective way. We will discuss this quietly. And we will have the breaks in here. We will talk about Sharia today. It’s Sharia, which is a problem for us. We will go in more detail. There is Sharia in finance resp. monetary system. We will talk about the organisation of Islamic states. We will talk about the term “Islamophobia” and how they use it, to prohibit criticism on Islam. We will talk about human rights in Islam. A point which affects me at the moment. We will talk about women’s rights and — if we have time — about female circumcision. We could miss this out and you read about it. Honour killings, which of course have a relation to human and women rights in Islam. Which consequences does Sharia have for Europe? What happens if Sharia is implemented? In fact, it is implemented already. These violations of human rights in Islamic countries concern Muslims and Non-Muslims. A woman is only half the worth of a man. Her words, her evidence, her position in society. Sharia means censorship and prohibition of criticism. We have seen this already. What happened today is — Sharia. I talk about the so-called “hudd”-punishments. Cropping off hands, stoning. All the cruelties, which — as they say — have nothing to do with Islam. You know by now that one loses any right of freedom when one converts to Islam. All this is regularized in Sharia. There is no Islam without Sharia. An Islamic society with the sharia is an ideal. Remember the first page. Islam is a religion and a state. As according to the Islamic point of view, divine law stands above state law. But you may remember the closure of the Ijtihad in the 11th century. Okay, no discussion and — of course — no denial. This is also pedals the man. It makes life difficult for men. Monogamy is only regulated by law in Turkey and Indonesia. Allows him to beat his wife whom he loves — or not. This is emotional stress. Scholars say that this is a determent. But I doubt this. I have not heard about any other judgements. Not yet. Here we have some examples how sharia is realized. We will not discuss this now. If you say, yes, this is sharia and it’s awkward, then it’s time to stand up and say: not with us! If you say, no this is nonsense, it’s just far-fetched cases, then it’s also okay for me. I look at the facts and do a reality-check. And they are becoming more and more. Women are not treated equally by this religious law. This is a fact. One can refer to their books, although they’d like to explain differently. It is a fact. According to our law — yes. According to Koran respectively sharia — no. And from which legal position will the judges act? Above all, when we will have the first muslim public prosecutors and judges. Which law are they to execute? Evidence of women, you know that, only counts half the evidence of men. Women only have restrained right to give evidence. defense? Please let us know. I am moved by the level of support I am receiving. Currently, there is no need for donations. However, things may change fast. If they do, you will find out here at GoV. I want to thank PatriotUSA for reviving this particular article, because a zombie thread it most certainly isn't. I was in Asia during the time that all of this first broke at GoV and, consequently, unaware of what was going on. I only managed to learn about it in a subsequent email exchange with Elisabeth herself. From what I understand, Elisabeth is still facing legal charges by the Austrian authorities and this is no laughing matter. In the next few weeks, I'm going to try and find out if there isn't some way to pull together more information about this whole matter and see if there are any technical differences from the Geert Wilders case that can be exploited in favor of the defense. I have long maintained that Europe is in the process of criminalizing Free Speech. A major goal of Political Correctness is to so thoroughly interdict free expression that it eventually inhibits even the origination of independent thought. It is Orwell's Thought Control marching under the false colors of supposed "harmony" and that code word for Communism's long-standing agenda, "social justice". Once the basic process of ideation has been inhibited the individual's ability to discern actual truth is typically so eroded that there remains little hope of it being reached through independent means. This enables those in control to dispense whatever pap and drivel they wish to be perceived as "truth". THE TRUTH IS NO LONGER THE LAST AND BEST DEFENSE. "In a time of universal deceit, telling the truth is a revolutionary act.". Where can one donate to her defense? Please let us know. We have thought of that, and decided that for the moment, no defense fund is needed. We do not know if this will be taken to court or dropped (it should be dropped, of course), and it would be somewhat premature to ask for monetary support before we know if this becomes a real problem. Of course some lawyer fees apply already, but that's relatively minor. If the prescribed penalty included public stoning, this mockery could have been taken from the pages of sharia law. I recommend Ayn Rand's works, and Elan Journo's book Winning the Unwinnable War for a complete analysis of the causes and cures of the current state of Western culture, and how to fight Islamic Jihad. I find it interesting that the Austrian police apparently are following in the footsteps of their fine German brothers under the Nazis. After all, without THEIR support, there would be no trial.